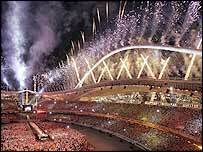 The 2004 Olympics come to an end with a spectacular closing ceremony in Athens. What does it take to become an Olympic champion? What have been your highlights from the Athens Paralympics? Which Brits exceeded expectation and who fell flat in Athens? Who exceeded expectations, and who failed to deliver? Will the golden glow fade? Is British athletics set fair after Athens - or heading for the rocks? Record tests, so the worst Games ever or start of the fightback?